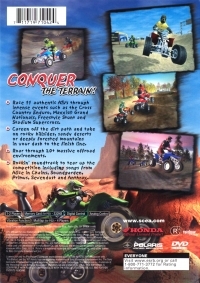 Box Text: CONQUER THE TERRAIN! - Race 11 authentic ATVs through intensive events such as the Cross Country Enduro, Maxxis® Grand Nationals, Freestyle Stunt and Stadium Supercross. - Careen off the dirt path and take on rocky hillsides, sandy deserts, or deeply forested mountain trails in your dash to the finish line. - Roar through 20+ massive offroad environments. - Rockin' soundtrack to tear up the competition including songs from Alice in Chains, Soundgarden, Primus, Sevendust and Anthrax. 03-03-2018 insettasport Box Text CONQUER THE TERRAIN! - Race 11 authentic ATVs through intensive events such as the Cross Country Enduro, Maxxis® Grand Nationals, Freestyle Stunt and Stadium Supercross. - Careen off the dirt path and take on rocky hillsides, sandy deserts, or deeply forested mountain trails in your dash to the finish line. - Roar through 20+ massive offroad environments. - Rockin' soundtrack to tear up the competition including songs from Alice in Chains, Soundgarden, Primus, Sevendust and Anthrax. 06-01-2013 theplaingamer Box Text CONQUER THE TERRAIN! Race 11 authentic ATVs through intensive events such as the Cross Country Enduro, MaxxisÂ® Grand Nationals, Freestyle Stunt and Stadium Supercross. 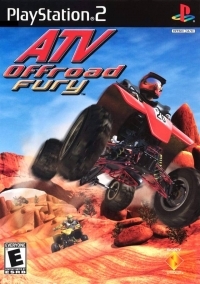 This is a list of VGCollect users who have ATV Offroad Fury in their Collection. This is a list of VGCollect users who have ATV Offroad Fury in their Sell List. This is a list of VGCollect users who have ATV Offroad Fury in their Wish List.